I’m definitely NOT a big drinker. I might have a beer while watching a football game. I might have a glass of wine during Christmas or New Year’s Eve dinner, but that’s about it. And the last time I had hard liquor, it was a Dewar’s while flying home from the UK in business class last January. So, for someone like me, Oneglass™ wines would be a good idea. 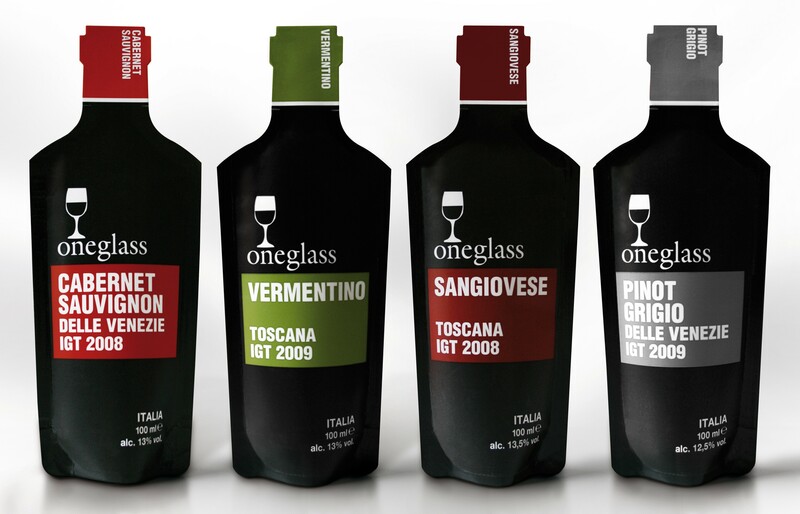 The 100-ml single-serving, flexible pouches of Pinot Grigio, Vermentino, Cabernet Sauvignon and Sangiovese wines from Verona, Italy-based Oneglass are just the right amount. No more opening a bottle with the risk of not finishing it (my wife drinks alcohol even less than me). The Oneglass packaging laminate—a foil-lined, 74%-paper construction—is reportedly ideal for maintaining the taste of the wines. After filling, the bottle-shaped standup pouches are topped off with nitrogen gas to eliminate product oxidation, and after use, they can be easily flattened to take up less space in your recycling bin. Oneglass is currently on sale in Italy; trade agreements are underway for distribution in Germany and Japan. Tasting Boxes of 16 pouches are sold online at the Oneglass Website. My Thoughts: The evolution of single-serve wine packaging inevitably would come to flexibles. Putting aside snooty wine connoisseurs and their predictable laughter at Oneglass, the package clearly has merit in terms of source reduction and sustainability. Transportation costs are also a fraction of shipping glass bottles around—even 100-ml bottles. What’s not so clear is the recycling aspect. Glass can be recycled forever, as far as I can tell. Used Oneglass pouches can probably best be processed into some kind of fuel pellets for energy generation. For packaging converters, anything that grows the market for web-processed, flexible substrates is all the better. Obviously, such wine pouches are now a tiny sliver of the field. Only time will tell how much of the global wine market will eventually shift over to more Earth-friendly, convenient containers such as Oneglass. This entry was posted in flexible packaging, paper/paperboard/cartons, sustainability and tagged flexible packaging, packaging, paperboard packaging, recycling, source reduction, sustainability. Bookmark the permalink. Wow, this is a great idea and I’ll bet there will be plenty of retail sales. Perhaps not, as you say, the connoisseurs, but these single-serve pouches may find an audience with more casual wine-drinkers. Actually, EnVision already makes this type of pouch albeit smaller for hard liquor! It’s a great way to package single-serve economically! Nice article. What incredible growth we are experiencing with the Standup Pouch Packaging format which is proving to be capable of truly “partnering” more traditional packaging formats. Not often does a single packaging concept leapfrog so many different markets and create such great opportunity to re-invent mature flat-growth product categories.